Using the daily data collected through Kantar GeoPoll Media Measurement, GeoPoll has analyzed the top radio stations in Tanzania for the period from May 1st – July 31st. We examined both ratings* and share** for the top stations in Tanzania. The below chart shows the average ratings for the top 10 radio stations during the day from 06:00 to 22:00. Clouds FM had the highest average ratings from May to July, getting a rating of 10.0 or higher throughout the day. Radio Free Africa and TBC Taifa come in 2nd and 3rd respectively, with ratings closer to 4.0. 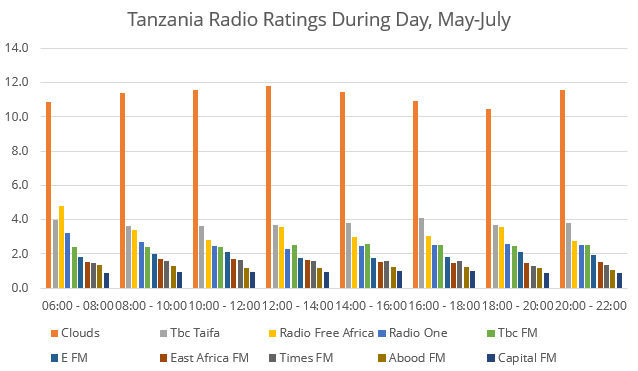 Radio Free Africa and TBC Taifa saw their highest ratings in the morning, with Radio Free Africa having an average rating of 4.8 from 6:00 to 8:00. The early morning slot is the only time during the day that Radio Free Africa had a higher rating than TBC Taifa during this time period, however the two stations remained close in ratings throughout the day. GeoPoll also examined average share over the entire period from May 1st – July 31st. 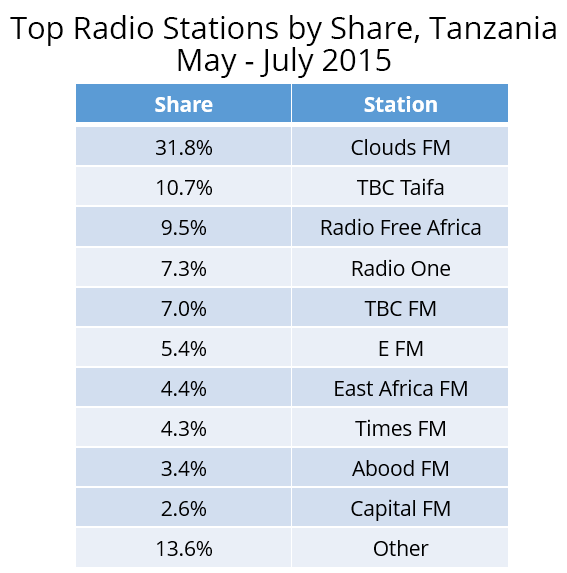 Clouds FM commanded almost a third of the market share, 31.2%, far ahead TBC Taifa which came in 2nd, with 10.7% of the listening audience tuned into TBC Taifa on average. There was only a small difference in share between TBC Taifa and Radio Free Africa, which had a share of 9.5%. Rounding out the top 5 stations for this period are Radio One and TBC FM. Due to regional radio stations, 13.6% of the audience on average was listening to stations other than the ones listed below. A comparison in share between February to April 2015 and the current period shows an increase in share of 7% for Clouds FM. We observe a marginal decline in share for TBC Taifa and Radio Free Africa, who had 12% and 10.2% audience share respectively earlier in the year. To subscribe to Kantar GeoPoll Media Measurement and view daily data on Tanzania radio ratings, filterable by region, demographics, and pyschographics, click below.